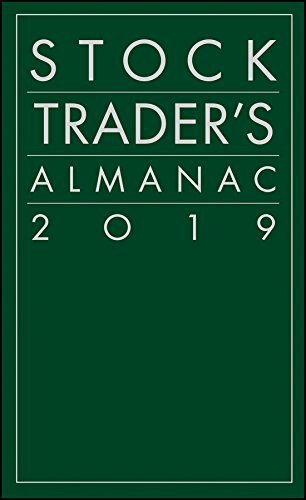 Stock Trader's Almanac 2019 provides the cleanest historical data in the business to give traders and investors an advantage in the market. The 2019 edition is consistent with decades of the Stock Trader's Almanac showing you the cycles, trends, and patterns you need to know in order to invest with minimum risk and maximum profit. Updated with the latest numbers, this indispensable guide is organized in a calendar format to provide monthly and daily reminders, including upcoming opportunities to grab and dangers to avoid. Proprietary strategies include the Hirsch Organization's Best Six Months Switching Strategy, the January Barometer, and the Four-Year Presidential Election/Stock Market Cycle, arming you with the tools savvy investors use to achieve their market goals. Trusted by Barron's, The Wall Street Journal, the New York Times, and other respected market authorities, this indispensable guide has helped generations of investors make smart market moves. This new edition provides the same level of invaluable guidance, with the latest data straight from the vault. Analytical tools are essential to successful investing, but they're only as useful as the data is accurate. Even the most beautifully designed model cannot forecast accurately based on incomplete, misleading, or inaccurate numbers; data quality is the bedrock of your entire investing strategy, and when it comes to data, cleanliness is next to profitability. Get the edge this year with the best data in the business, plus a wealth of valuable strategies in the Stock Trader's Almanac 2019. By Blue Owl Press, Inc.